"From the bottom of my heart I want to thank you for creating something beyond special for Sarah’s bat mitzvah. The word montage sounds so inappropriate for what you made us. We have to find you a new word. This family archive was beautiful, and fun and so personal. I think I’ve watched it a million times, and I never get tired of it. Somehow you managed to find the right balance of everything and created 20 minutes of pure amazing. I recognize how you truly went above and beyond for us." - Joana B. "Was a huge hit. Great job and thank u again. Everyone loves. Real tear jerker. All the best." - Scott S.
"Just wanted to send a heartfelt thank you and express our immense gratitude for all of your work Saturday. I think a skilled videographer is someone who is there, but you don’t even notice, because he integrates himself so seamlessly into the background. This was exactly you! Thank you for capturing all of the interviews we requested." - Stephanie D.
"I can’t thank you enough for sharing your talent with us. Everyone loved your montage! You are incredibly patient and great to work with!" - Lara F.
"Dear David, thank you so much for the incredible work you do. It was a home run. We just watched Michael's entire Bar Mitzvah video again. You did an amazing job." - Desiree L.
"Thank you, thank you! For the best montage ever! Everyone LOVED it! Especially us!!!" - Leslie K.
"Awesome night, David! 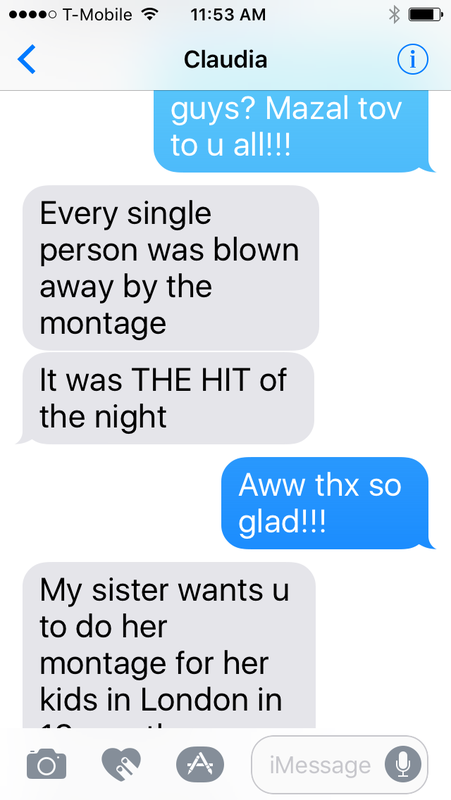 The montage was a big hit!" - Cliff L.
"David, I know patti conveyed our thanks, but you are THE BEST!!!!!!!!!!!!!!! I have watched the montage about 10 times and it never gets stale. Thanks for being a huge part of an amazing celebration." - Randy W.
"Amazing and the montage was great---thank you for adding that last homerun. We had a very baseball-centric crowd and they loved it." Jean K.
"Everyone loved the montage. People were blown away. Amazing job!!!!!" Leslie H.
"I can't thank you enough for the incredible work that you did on Jordan's montage. She was blown away and I heard from so many people that it was the best montage they have ever seen." - Phillipa A. "Montage was fantastic. It got rave reviews" - Ellen H. "David...I just watched the montage for like the 20th time...LOVE IT!! Every time I watch it I love it even more! It was one of my favorite parts of the whole bar mitzvah process…..and I will DEFINITELY be contacting you again in a few years for my daughter!!! Thanks so much!!" - Laurie P.
"The movie was a big success. It is a very good portait of Felix and it was so nice to share it with all his and our friends!" - Godeliene Z. "Thank you once again for really going above and beyond in the day and night of Lola's Bat Mitzvah." - Mahtab H.
"Omigod the montage was amazing !!!!!!! Truly perfect ! Can't. Wait to watch it again ! I was too busy watching Ian loving it to catch it all!" - Stephanie B. "I want to thank you a gazillion times. Your work is so outstanding. I am speechless, which is rare!! Thank you Thank you." (and) "SOOOOOO Happy, want to scream from the roof." "I asked the girls on the way to school to share their favorite parts of the day, and Grace said it was the montage. HONEST!!!" (and) "Hi David, This is just one of the multiple emails of same sentiment, each struck by the montage. Thank you so very much...(then from her friend) Rachel - Thank you so much for including us in the girls' special day. It was beautiful!!! It was great to see you all and that was the best montage we have seen to date - creative, clever and your girls are sooo cute!" "You are amazing!!!! We can't tell u enough how happy we ALL are!!! Thank u sooo much!!!!" "Hi David, I will share more with you later but everyone absolutely LOVED it! Thank you very very much!" "The montage was a HUGE success! Everyone commented on how unique it was and so many people could not believe Jake did not know about Morgan’s part – very well staged! We can't thank you enough. It really started off the portion of the evening just before Jake's set on the guitar beautifully. I think Jake is going to become a legend as a result of the night!" 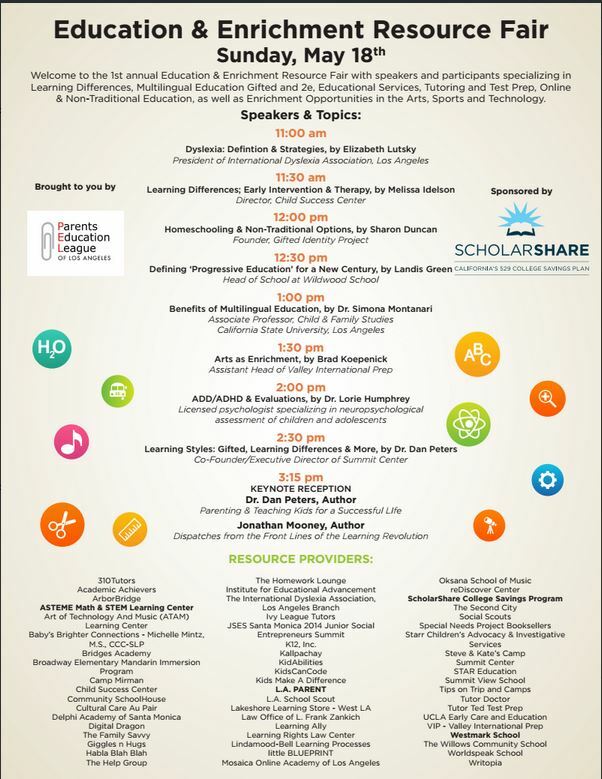 May 13th: Excited to be there capturing the incredible speakers lined up for the 1st annual Education & Enrichment Resource Fair Sunday May 18th in what is certain to be an amazingly insightful afternoon! Thanks to Desiree and the Parents Education League of Los Angeles! August 22nd: Come see us at the upcoming exclusive Mountain Gate Bridal show in September. Check back for more details! August 20th: Congratulations to Bradley, Evan & Matt!! May 14th: Steve & Jerri tie the knot in Nashville, Tennessee. Check back tomorrow to see their unique wedding montage! January 29th: Sam's montage is debuted at his Bar Mitzvah! January 22nd: Ari & Grace's montage is debuted at their Bat Mitzvah party! December 18th: We are happy to report there's been an excellent response to tomorrow's quinceaneras fashion show at Jessica's Bridal in San Fernando. It's gonna be packed! The large screen is set up, the DJ's gear is wired, and the model's runway is being finished. Only a few passes left - let us know if you want to attend and come see us there! December 16th: Part 2 is published from David Hillenbrand's continuing series: Video Montages Tech Talk Tutorial. Stay posted for part 3, publishing soon. November 26th: Ezine Articles publishes part one of David Hillenbrand's Video Montages Tech Talk Tutorial. Stay tuned for part 2 in the ongoing series. November 13th: All About U Montages created this 70th birthday montage and debuted it live on the big screen at Sara's surprise party Saturday night. Not a dry eye in the house! November 1st: Buzzle.com features an article by All About U Montages: The Top Ten Most Frequently Asked Questions About Video Montages for Special Events. October 6th: Click here to read an article published by AAUM's David Hillenbrand that offers some tips on a successful bar or bat mitzvah montage. A beautiful new venue has just opened in Santa Clarita, Gardens of Paradise and we happen to know the owners! They have a gorgeous facility and grounds and will help make your dream wedding or awesome bar/bat mitzvah event come to life! Mention David from AAUM sent you and they will take care of you with an incredible package for your event. A photo booth or green screen booth is a fantastic, fun addition to any event, and we got just the company! Call Mike at Hollywood Photo Booth at 310 756-4098 to reserve your date, and tell him we sent ya! They are the best! Need an incredible, artistic wedding photographer (plus graphic design!) who's a pleasure to work with?! We've got just the one! Click on Zoom Theory Photography and check out their amazing work, or call Meredith at 310.433.4221. You'll be glad you did! This month's top venue pick is MountainGate Country Club. Call Bridget McCulloch at 310.476.6215 x208 and see your dream wedding come to life! AAUM has worked with some amazing DJ's, but this month's top pick is Randy Lehrman and his team at Real Genius Entertainment. Randy is awesome and with Real Genius we guarantee your party will totally rock! If you are considering venues in the Woodland Hills and surrounding areas, don't make a final decision until you've talked to Diane Friedland at the Warner Center Marriott. Diane is awesome at planning a great event and she will put together a very competitive package to suit your needs. The facility is beautiful, constantly upgraded and renovated for maximum beauty and function. Tell her we sent you and she will take care of you! Looking for the perfect Quinceañeras dress or bridal gown? Go see Anna, the owner of Jessica's Bridal in the heart of "bridal row" in San Fernando. She will take care of all your needs, and she can also help plan your party. Ask us about the special All About U Montages discount pass to receive $100 off your package purchase at Jessica's Bridal! Need an awesome wedding event planner? AAUM's top recommendation this month is Evette Knight Events. Give her a call for all your party planning needs. Need a tuxedo or formal wear accessories? Friar Tux has locations all over Los Angeles and will make you look incredible. If you are in the Northridge area, see Ed at the Tampa location. He will take care of you with expert service and attention to detail. Ask us about the special All About U Montages discount pass to receive up to 30% off at Friar Tux. Need a dress for your daughter's bat mitzvah or Sweet 16? Stop in at UN DEUX TROIS, with locations in Tarzana, Studio City, Brentwood, and Beverly Hills for a "Unique Shopping Experience for Girls & Tweens." If you're at the Tarzana location, see Ashley - she'll give you expert service and help you to find that perfect dress! Tell her Sharon from All About U Montages sent you! Looking for incredible party favors and gifts? Or creative table centerpieces? Go to Favors & Gifts By Design in Tarzana, where hundreds of items are on display. Sylvia is very creative and will make your party an event to remember! Need a quinceañeras event planner? Contact Celia at Tiaras and Tacones. She will plan and coordinate your entire event and will make it an unforgettable experience! For tips on the best of anything and everything in Los Angeles, check out Jen's List. Her recommendations will become an essential part of your daily life!